Norman Lamberty was born in Mauritius in 1912, one of 9 children. When he was a teenager, the family returned to Edinburgh and Norman was sent to the High School, and subsequently to Edinburgh University. After qualifying in 1939 he worked in The Eastern General Hospital, Edinburgh and at the start of the war volunteered for Service, joining the RAMC. He and Etta married shortly before he was sent to the Far East, where he was stationed in India and Burma. After the war he returned to Edinburgh, where his two daughters, Noreen and Anne were born, and gained his MRCPE in 1951 A few years later the family moved to Yorkshire where Norman ran the euphemistically termed ‘Special Clinic’ in Huddersfield and surrounding districts. In 1960 they moved to York where he became a Consultant in Genito-Urinary Medicine, running clinics also in Harrogate and Scarborough. He was a dignified man who was very well respected by colleagues and patients alike and had a wonderful sense of humour. 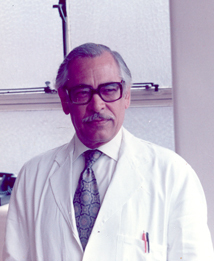 Norman retired in 1977 and was elected FRCPEd. in 1998. He and Etta moved to Kirkcaldy 9 years ago to be near their family. Norman was widowed in 2002, but continued to live in his own home until January of this year. He died peacefully on August 12th 2006.